The UFC 124 is coming in a few weeks. The anticipation from UFC fans is on its peak. Fighting Insider stirs more the excitement of people with an exclusive trailer of the event. In less than two weeks, UFC welterweight champions Georges St-Pierre and UFC top contender Josh Koscheck will meet on the octagon. The two fighters will headline the coming UFC 124. The event will take place at the Bell Centre in Montreal and airs live on pay-per-view. FightingInsider.com embedded the video trailer together with the full fight card. UFC 124 just ended the latest season of “The Ultimate Fighter,” which featured St-Pierre and Koscheck as coaches. There will be no “TUF 12″ episode airing this week due to Thanksgiving celebration. But, a two-hour season finale next week will determine the last two finalists who will meet at The Ultimate Fighter 12 Finale on Dec. 4 in Las Vegas. The coach versus coach bout is a much awaited part of the reality show. Koscheck needled the champion all throughout the three-month long series on Spike TV, but St. Pierre gains victory most of the time. 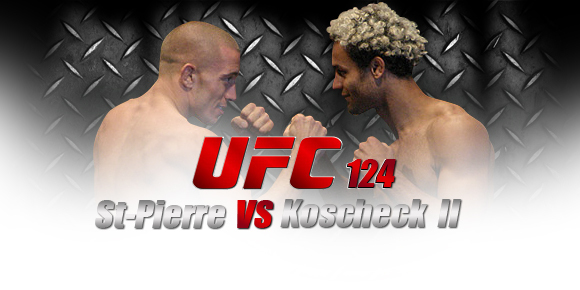 St-Pierre and Koscheck fought in 2007 at UFC 74. St-Pierre dominated Koscheck for a unanimous-decision victory. St-Pierre has reclaimed the title after a year during UFC 83, where he had a rematch with Serra and scored a magnificent TKO win during the promotion’s first trip to the Bell Centre. Since that event, he had continuously defended his title four times. Winning over Jon Fitch, B.J. Penn, Thiago Alves and Dan Hardy. On the other hand, Koscheck has a 6-2 record since his first St-Pierre fight. This record included victories over Dustin Hazelett, Chris Lytle, Frank Trigg and Anthony Johnson. He secured his victory on the title shot with a decision win over Paul Daley.